If your home has hard water, your faucets and showerheads are bound to look like artifacts from the Titanic, and it probably drives you crazy. Mineral build up isn’t just icky looking, it also slows your water stream. So what causes this and how do you get rid of it? Looking to get rid of these ugly mineral deposits? Read on for step-by-step instructions on how to remove mineral buildup on faucets and showerheads. Acidic liquids are your best friend when it comes to battling mineral deposits. Acid eats away at calcium and other minerals that build up on faucets and showerheads. Note: Make sure you are working in a well ventilated room if you are using a strong acid like muriatic acid. Most DIY sites suggest the plastic-bag-over-the-faucet approach to removing mineral deposits but this usually only removes buildup on the outside of the faucet. 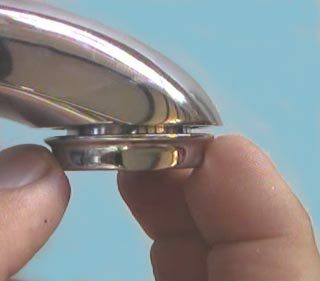 If you want to clean out the inside of your faucet or showerhead and prevent future clogs, we suggest you also remove the faucet aerator or showerhead from the base and clean these separately. The aerator sits on the tip of the faucet head. To remove it, stand over the faucet and grip the aerator (you may need a pair of pliers). Twist counterclockwise (left) until the aerator screws completely off. Be careful to keep track of gaskets and other components so that you can reattach everything in proper order afterwards. First, wrap an old towel or rag around your shower fitting to protect the metal. Then use a pair of pliers to grip the connector and twist counterclockwise. You may be able to do this with your bare hands. Once you’ve removed your aerator or showerhead, put your protective eyewear on and pour your cleaner of choice into a bowl. Gently place the removed fixtures into the cleaner. Pay close attention to directions on the label for diluting stronger acids with water and to judge how long you should soak your fixtures. To clean the rest of your faucet/shower fixture, fill a plastic bag with your cleaner (follow the same diluting and timing rules) and secure it around the fixture with a rubber band. Note: Strong acids like muriatic acid, sulfuric acid, and phosphoric acids shouldn’t be used on certain surfaces. Read the labels carefully before using. If the base of your faucet has mineral buildup as well, soak an old towel or rag in vinegar and wrap around the area. Leave on for an hour or two then scrub off the remaining build up. When your aerator or showerhead is done soaking, scrub the surface with your soft cloth, sponge or toothbrush to remove remaining mineral deposits. This is an important step because acids can eat away at metals if they’re left on long enough. Once your aerator or showerhead is clean, reconnect them (keeping gaskets and other components in proper order) to their fixtures. Want to prevent mineral deposits altogether? If you live in Sarasota, Bradenton, Tampa, or the West Florida area, chances are this isn’t the last time you’ll need to scrub away mineral buildup. Your best bet is to invest in a long-term solution like a water softening system. Water softening systems “soften” your home’s water by removing hard, damaging minerals in your water like magnesium and calcium. Live in Sarasota, FL or the surrounding areas? Contact us to learn more about how our water softening systems prevent mineral deposits and extend the life of your appliances. Water Softening vs. Reverse Osmosis: What’s the Difference? Can Florida’s Hard Water Damage My Skin?